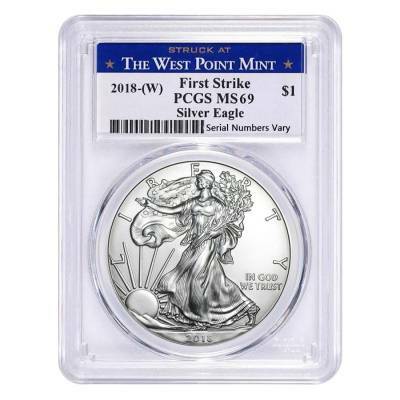 This superb 2018 (W) 1 oz Silver American Eagle Coin PCGS MS 69 First Strike (West Point) is among the latest American Silver Eagles authenticated by PCGS as almost flawless and identified as struck at the West Point facility. The Silver Eagle series was introduced by the US Mint in November 1986 and is the official silver bullion coin of the US. Since its debut, the design of this legendary coin hasn’t changed, representing the famous Walking Liberty image originally created A. Weinman for the 1916-1947 half dollars. A well-known symbol of American patriotism, spirit, and greatness, this splendid piece has been certified within the first mintage month as having less than two almost invisible imperfections and being minted at the West Point facility, housed in the special West Point holder from PCGS. For this reason, this astounding coin is a wonderful addition and a treasured keepsake for any collector or investor. Coin grading companies can now identify the facility location of the Silver American Eagles. Although these bullion coins do not carry any mintmarks, the mint boxes bear individual serial numbers which can identify their origin: West Point boxes have a six-digit serial number starting with 1,2,3, or a five-digital serial number which starts with the WP prefix. Boxes coming from the Philadelphia facility have a five-digit serial number starting with the number 1 while those struck at the San Francisco facility carry a six-digit serial number which starts with the number 4. Therefore, NGC and PCGS attribute the “W”, “P”, or “S” designations to the coin’s original labels and Bullion Exchanges is proud to offer the entire collection of certified Silver American Eagles with the mint locations revealed. 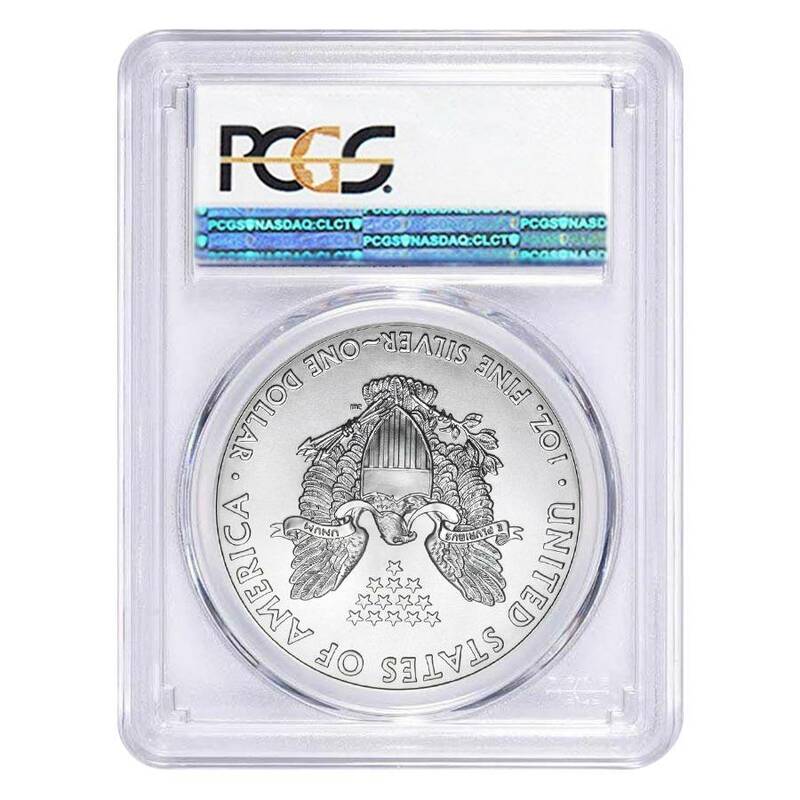 Offered in the well-known West Point holder from PCGS. Bears a $1 USD denomination. 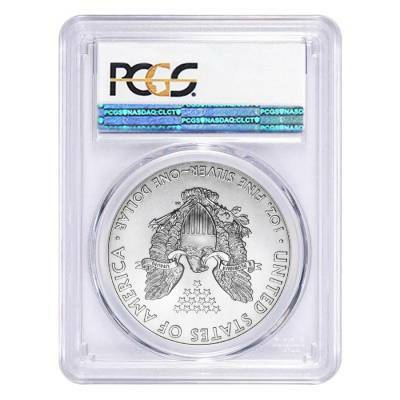 PCGS MS 69 First Strike: The coin comes in mint state condition and is certified as carrying no more than two almost unnoticeable wear or tear marks. Authenticated within the first 30 days of issue. Legal tender in the United States. Obverse: Showcases the superb Lady Liberty as confidently walking towards the sunrise with her body enveloped in the folds of the US flag with an oak branch in her left hand. Engravings: “Liberty”, “2018”, and “In God We Trust”. Design: Adolph A. Weinman. Reverse: Displays the majestic heraldic eagle holding a shield, an olive branch and arrows, with the 13 small stars above. Inscriptions: “United States of America”, “E Pluribus Unum”, along with the weight, purity, and denomination. Design: John M. Mercanti. Bullion Exchanges offers you an exceptional selection of splendid certified silver coins of superior quality. 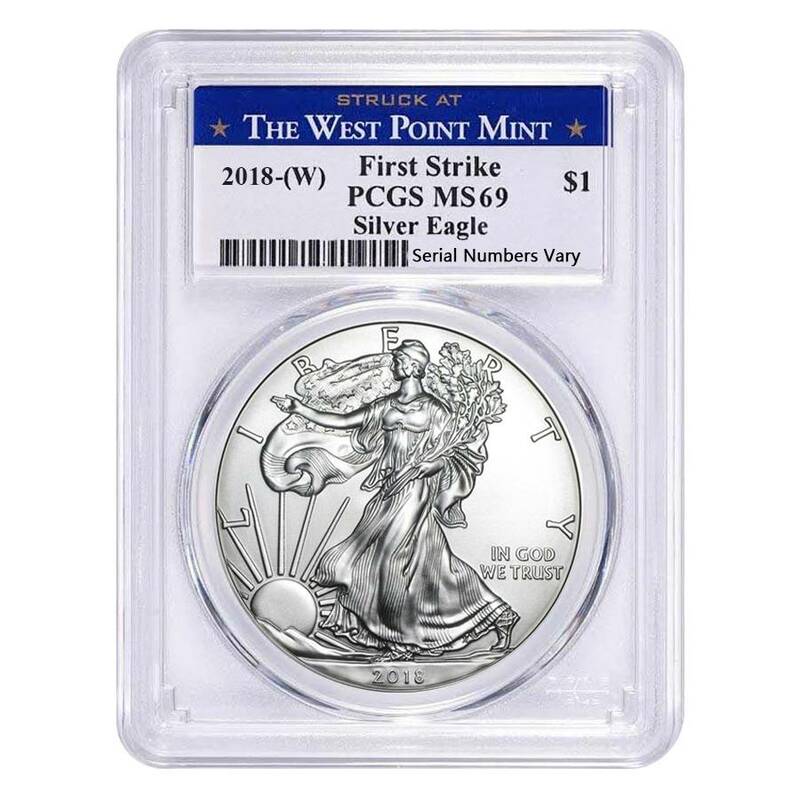 Add this wonderful 2018 (W) 1 oz Silver American Eagle Coin PCGS MS 69 First Strike (West Point) to your portfolio today, and it will be carefully wrapped and delivered to you. For any questions, just write us a message or call us at 800.852.6884, and we will happily assist you. Totally satisfied, will order more! Great customer service, my questions were answered quickly and a nice, easy transaction. This is a very good deal. Highly recommend. Timeless coin! Always a good idea to add to any portfolio. For every $1 spend, you will earn 1 Bullionaire Buck which is equivalent to $0.001 off a future purchase. 26 BB = $0.03.